You'll be amazed at what cobblestone walking can do for you and your family! The Chinese have know for centuries that walking barefoot on cobblestones helps health and longevity. In fact they actually build sidewalks with cobblestones because it provided such fabulous health benefits. But we all walk in shoes and cover the over 600 acupressure points in our feet that can keep us healthy when we stimulate them. •	Is good health important to you? •	Do you want to work on an existing health problem or prevent future problems? •	Are you one of the growing number of people who are are looking for NATURAL methods to enhance their health? 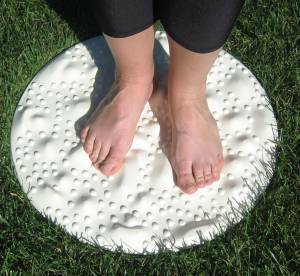 All entails is 10 minutes of daily walking on the reflex-o-board's knobbly surface. •	Having one in your home is like having the ability to give yourself a 10 minute health 'tune-up' every day and right in the comfort of your own home. Talk about a fabulous way to help your health and work on 'prevention'. •	Being able to do cobblestone walking on my reflex-o-board right in my own home, beats taking pills because it has no known side effects. •	You only need one for the whole family - kids love it too! My nephews love cobblestone walking and dancing on it. You know kids, they just can't help turning everything into fun. •	It's unbreakable and easily portable - I often pop mine in my suitcase if I'm travelling. •	You don't have to find a place to store it, it slips right under your bed, or behind a couch. Reflexology is an ancient method of healing involving pressure applied to specifice reflex points usually on the feet (but also on hands and ears). While reflexology is most commonly done by hand, it can also be achieved by the cobblestone-like walking paths that are commonly found China. The uneven surface of the cobblestones stimulate and regulate "acupoints" located on the soles of the feet. 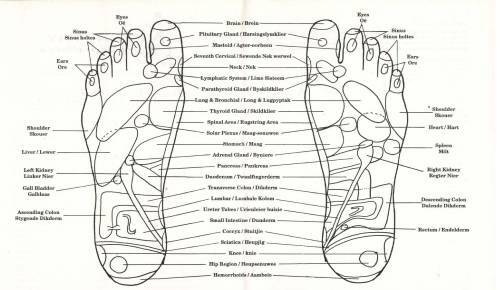 This stimulation of these acupoints on the feet facilitates the flow of 'chi' (energy) through the meridians (channels) of various body organs. This stimulates the body's own abilities and powers of healing. The pressure points on the feet have been 'mapped' out. For example, the reflex point on the big toe relates to the head and brain, the other toes to the sinuses. And the spine follows the side of the foot. When the relevant reflex point is massaged, it relieves tension and clears any energy blockages in the corresponding part of the body such as the spleen, pancreas, liver etc.. just like when you do cobblestone walking on a rough surface barefoot. Clinical and anecdotal evidence shows that regular use enhances circulation, metabolism and other body functions by harnessing the tried-and-tested principles of REFLEXOLOGY. •	Reflexology is a fabulous stimulator for blood circulation - many users of the reflex-o-board reports feeling tingling in their legs after using it. •	It stimulates the lymphatic system which helps eliminate toxins from the body and relieve fatigue. •	It boosts the immune system and helps to keep the entire body in better balance. And it does all this without that long list of counter indications as long as your arm, as do some of those costly pills. Reading anecdotal evidence about the Reflex-o-board (which mimics cobblestone walking) has always amazed me! 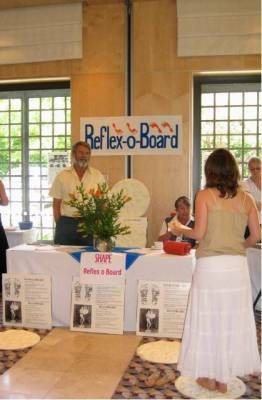 I was recently flipping through a file of letters written about the Reflex-o-Board (which used to be known as the Reflexology Healthboard) and came across one that claimed to have helped someone with their weight! What this seemingly simple product apparently does pretty much blows me away. I'm constantly amazed at what people claim this round piece of plastic (that my father claims "looks like a giant-sized pizza with a bad case of acne")has helped them to cure. I know that it saved me from shoulder operation on a frozen shoulder anddid wonders for my menstrual cramps I know that my father who had been struggling with arthritis (and insomnia) found it to be almost miraculous. And my grandfather (who lived to the ripe old age of 101 and was as sharp as a button) found it also helped with his circulation (it cured the ulcerated sores that wouldn't heal on his shins) and even his opthalmic surgeon, Dr. Rogers, was impressed at his vastly improved eyesight. I also know that when it was taken to the University of Stellenbosch for trials that the Prof who ran the trials (Prof Bressan) asked if she could keep her board because it helped so much with her Varicose veins. Their research findings showed it helped for stress. Like I say... from migraines to backache and many other pain-related conditions to you-name-it, the letters written from satisfied users about what this funny looking product heals are pretty incredible. The REFLEX-O-BOARD has been around for over 20 years. It has assisted around 30 000 satisfied users to enjoy healthy living. This is why we weren't at all surprised (but we were excited) to read about research confirming some of what clients have written to us about the reflex-o-board and cobblestone walking. Science Daily of June 2005 reported that scientists at the Oregon Research Institute (ORI) in Eugene confirmed earlier findings from a pilot study that walking on a cobblestone surface (like the reflex-o-board) resulted in significant: reductions in blood pressure and improvements in balance and physical performance among the research population group who were adults aged 60 and over. "These are very exciting results," said John Fisher, Ph.D and lead researcher at ORI. •	The Reflex-o-Board may be nothing short of miraculous but here's something you need to know. Um.....It doesn’t emit magical rays – you do actually have to walk on it for it to work. Smile! •	Initially, you may find walking on it painful. But once you're used to it, it'll leave you glowing! I suppose the thing that amazes me most about the Reflex-o-Board is just how affordable it is. I've had mine now since 1991 and when I think about the benefits I've received from it, and the doctors bills it's saved me - it has paid for itself ka-zillion times over. This isn't like paying for pills for months or years even. That's a once-off payment. Once you have it, your reflex-o-board will last you (and your entire family) for life! P.S. Don't delay. You're a few clicks away from walking your way to health! And they make the most fabulous gift too!